Imagine starting your journey together ‘Happily Ever After’ with one of our Maui Wedding Packages! At ‘A Promise Made in Paradise’ we keep your wedding affordable. There are so many Maui wedding companies I am happy to prove to you personally that you can be married on Maui for ‘not a fortune’, or maybe a small fortune, if you like. Most of the costlier weddings include a private location, $500-$3000 for the venue alone. I can arrange the venue, the reception and anything and everything you can dream of or you have the choice of a beach wedding that is free location. All the beaches in Hawaii are public and free. I am required to obtain a permit, for commercial use of the beach, which I apply for online and charge back to you according to how many guests you have. The permit is a $30 minimum license fee. At ‘A Promise Made in Paradise’, all the photography is done in-house, Judy Grodan and daughter Ana Grodan. This is the major reason the package prices are so reasonable. We also give you a real break on the flowers and so we offer flowers and lei at close to cost. We’d like your wedding experience to be accentuated with the color and fragrances the flowers bring to the occasion. Such is the privilege of Husband and Wife, to face the world strong with the strength of two, wise with the wisdom of two, and brave with the courage of two. The high and fine art of married life is in this mutual enrichment, mental and spiritual, this give and take between two personalities. You are about to enter into a union which is most sacred and most serious, requiring of those who enter into it a complete and unreserved giving of self. It will bind you together for life in a relationship so close and so intimate that it will profoundly affect your whole future. That future with its hopes and disappointments, its successes and its failures, its pleasures and its pains, its joys and its sorrows are hidden from your eyes. Love can make it easy, perfect Love can make it a joy. May, then, this Love with which you join your hands and hearts today never fail, but grow deeper and stronger as the years go by. Be grateful that within you is the dream of a great Love and the resources to use that Love in creating a Home that will endure. May this be the beginning of a relationship that will grow and mature with each passing year until the latter days become more wonderful than the first. The hand offered by each of you is an extension of Self, just as is your mutual Love. Cherish the touch, for you touch not only your own but another Life. Be ever sensitive to it’s pulse. Seek always to understand and respect its rhythm. Judy is the best! We loved the ceremony, video and pictures. We would definitely recommend this company to anyone looking to get married in Maui. Look no where else you will be overjoyed!!! You did my wedding on October 27th, on Secret Beach. What a special and amazing experience you have offered us! Everything was just perfect. You were very sweet to understand our situation and preparing everything perfectly for our special day! I cannot thank you and your crew enough for all! We are very happily married, and expecting a baby girl at the end of October! The Maui Wedding opened our door for starting a family of our own. Since we’re both adopted, it has a special meaning for me and Marcio! Say Thanks to Charles please for blessing our souls and spirits for this wonderful experience! Love……..love my pictures! Judy was able to give expert advise in picking a great location & time. Everything was arranged perfectly by Judy. I had no problem reaching her and responded quickly with any concerns. I would recommend using Judy for you destination wedding in Maui. Thanks for the great memories! This is what you can expect to experience with us. It’s always so good to hear the feedback because it makes me feel good having added happiness to someone’s life. That’s what we are here for, to make you happy, and happily married on Maui! 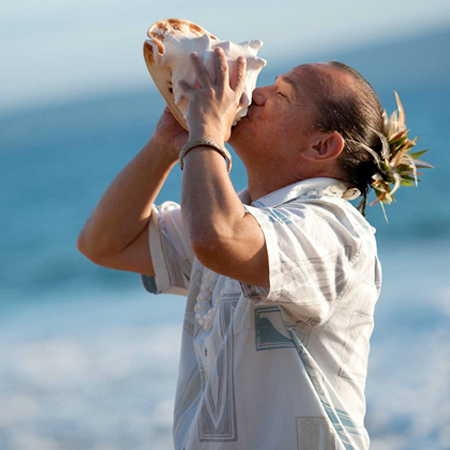 Lei greeting is a traditional Hawaiian etiquette that we include in all our wedding ceremonies. The exchange of leis is a sign of welcoming, love, and aloha. 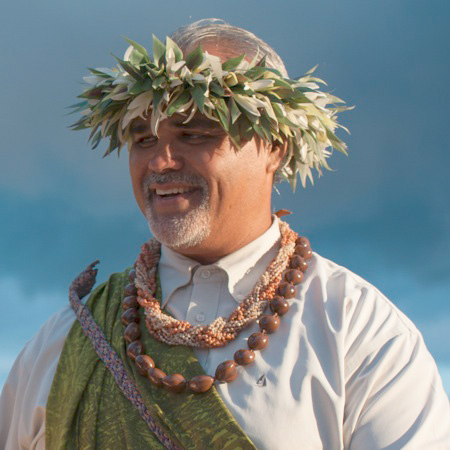 There are two leis included in each Maui wedding ceremony. The bridal lei is a white orchid and tuberose lei. The white orchid offers a nice visual, and the tuberose adds fragrance. The grooms lei is a green ti leaf lei. Green ti leaf leis are a symbol of appreciation, admiration, and respect. It is not fragrant but offers a nice visual and symbolic offering.The green ti leaf is a beautiful and green and thrives in the shade and cool of Haleakala below the 2,000 foot in elevation. 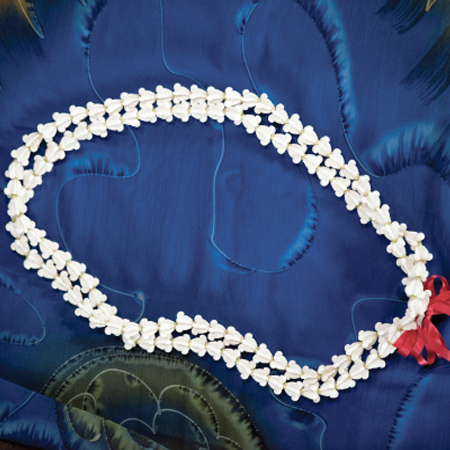 The Ti leaf lei can be upgraded to a Big Island Maile lei entwined with orchid and tuberose. You can upgrade to a world of choice. If you google image ‘Hawaiian lei’ you will find more than you can imagine. I can duplicate anything you find. I have been here 36 years, I know who to call and where to find it. You can upgrade to anything your heart desires. Try google image ‘Hawaiian lei’ and you will find more than you want to choose from. 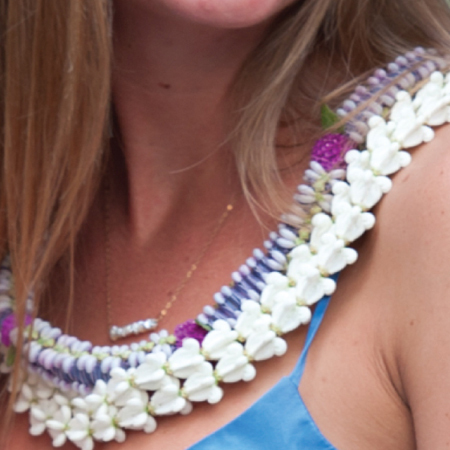 This is the very fragrant traditional Big Island Maile Lei twisted with orchid to match the brides orchid lei. You can have the Maile Lei made with or without the twist. This can also be woven together in a boxlike pattern with the purplish blue crown flower and bozo spacers. Again, made to order but only one strand. This is a very special lei. It is two or more stands of white crown flower. Made to order. This can also be woven together in a boxlike pattern. Again, made to order but only one strand. 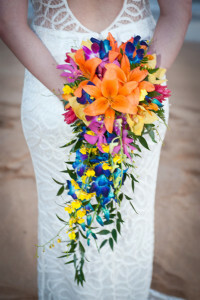 Maui weddings are about flowers, color and smiles! Treat your wedding day to a bouquet, and a hair flower of some sort. A beautiful bridal bouquet is a wonderful choice to brighten you wedding day. Not only does it compliment the lei, it adds as a vibrant prop for photos. The bouquet style is really all up to your imagination and preference of color combinations. Flowers offered here in Hawaii come in many color palettes and include tropical flowers, traditional assorted, or roses. If you have a specific bouquet design in mind, it is best to send a photo and my florist of 30 years experience can duplicate your perfect bouquet for you. Gardenia’s are lovely, haku’s are very Hawaiian and I have never seen a bride not look awesome wearing one. Braids, jeweled crowns, flower crowns. It’s all a good and can be yours, if you like, for close to my cost. The officiant is a very important ingredient to the wedding ceremony. I work with only the best, the person who can be truly interested and focused on you. I respect these guys for what they are and how my clients respond to them. My Hawaiian officiants all play ukulele and so that allows me to offer music to accompany the wedding ceremony without hiring a musician. And all are wonderful in their own person. You can find a interview with Charles Nahale on my facebook.com/mauius page. and Ernest and Laki can be found on a Google search . 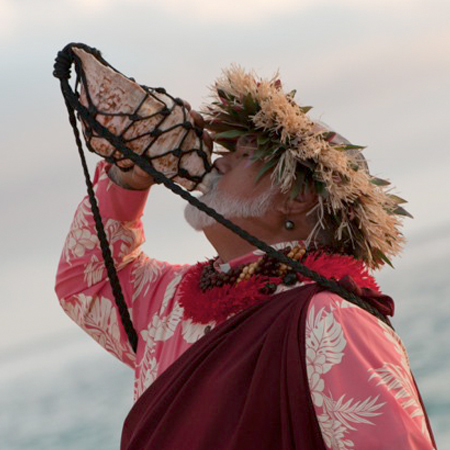 Each ceremony begins with blowing the conch and then a Hawaiian chant is recited in perfect Hawaiian. You won’t be disappointed.